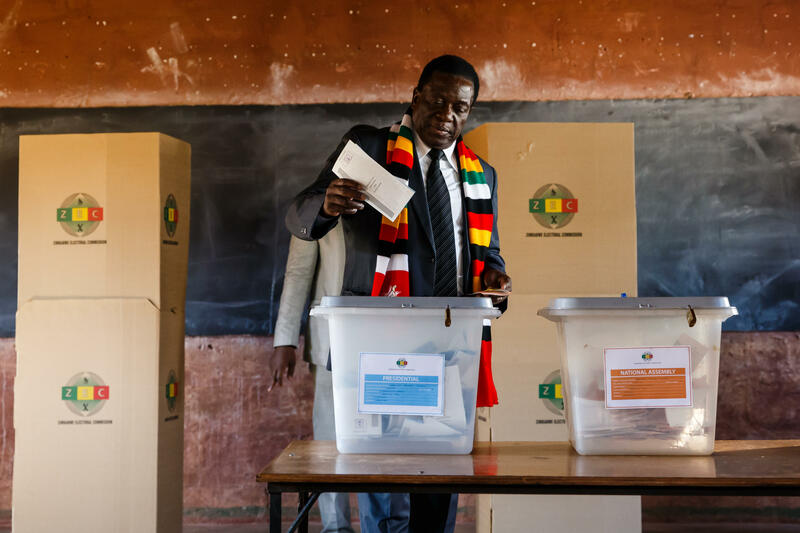 HARARE, Zimbabwe -- Zimbabweans on Monday were voting peacefully in their first election without Robert Mugabe on the ballot, a contest that could bring international legitimacy and investment or signal more stagnation if the vote is seriously flawed. About 5.5 million people were registered to vote in this southern African nation anxious for change after economic and political paralysis during the nearly four-decade rule of 94-year-old Mugabe. Thousands of election monitors fanned out across the country to observe a process that the opposition says is biased against them despite electoral commission assurances that it will be credible. The two main contenders are 75-year-old President Emmerson Mnangagwa, a former deputy president who took over after Mugabe stepped down under military pressure last year, and 40-year-old Nelson Chamisa, a lawyer and pastor who became head of the main opposition party a few months ago after the death of its leader Morgan Tsvangirai. Mugabe on Sunday called Chamisa the only viable candidate and rejected Mnangagwa and the ruling party, saying that "I cannot vote for those who have tormented me." Piercing whistles and cheers greeted Chamisa as he voted outside Harare, who declared on Twitter that "minus the ballot mischief ... Victory is certainly certain!" He said he hoped voting in rural areas, where most of Zimbabwe's voters are and where the ruling party usually holds sway, will be fair. Mnangagwa urged Zimbabweans to be peaceful, tweeting: "We are one people, with one dream and one destiny. We will sink or swim together." He voted and called the election peaceful, and he took Mugabe's criticism in stride, saying: "He is a citizen ... He can engage me anytime." "This is a critical moment in Zimbabwe's democratic journey," said Ellen Johnson Sirleaf, former Liberian president and a leader of one of the international observer missions. "The elections today provide an opportunity to break with the past," Sirleaf said at a polling station in a school in Harare. "The lines and voter enthusiasm we are seeing this morning must be matched by an accurate count and their choice must be honored." European Union election observers were seen at one polling station in Harare, checking the voting process. African Union observers attended the opening of polling stations elsewhere. CBS News' Debora Patta has covered two previous elections in Zimbabwe, under Mugabe, neither of which were deemed to be free or fair. "We've seen hundreds of thousands of opposition supporters being banned, being arrested, being detained, violence against them, being tortured, and in some cases even murdered," Patta said. President Mnangagwa blamed an attack last month on one of his rallies on a faction linked to Grace Mugabe, the wife of ex-president Mugabe. Dubbed "Gucci Grace" for her lavish shopping sprees, she was unpopular in the country. Mugabe wanted his wife to succeed him as president but he was forced to resign last year. Mugabe first came to power in 1980, and Monday's ballot is the first in the country since then to not feature his name. Patta reports that Mnangagwa is believed to have had a hand in rigging prior elections. But he has been trying to rehabilitate his image. "He has made significant changes in that country," Patta said. "For example, elections so far have been for the most part allowed to be conducted freely. Candidates have been able to campaign without any intimidation, without violence – notwithstanding the bomb attack, that was something that was a little out of the ordinary. Freedom of speech, things have started opening up there." Patta reports that Mnangagwa is also trying to attract international investors. That even includes legalizing medicinal marijuana farming, which has raised some eyebrows in the more conservative country.